Although not ‘technically’ a committee member, I’m pretty sure that if you asked any ML regular whether Jeff was important to Manchester scene, they’d respond with an emphatic yes. Jeff is a dance warrior. He dances when the music starts and only breaks for water. Though he may appear to be a man of few words, don’t mistake that for a frosty interior; he’s all heart (as long as you don’t insult Lester Young). I can personally attest that without his dancing and counsel, Lindy would not have become the joyous occasion that it is now. A firm follows’ favourite, you should always grab a dance – when he’s not in his native New Jersey. Read on to discover some more about Manchester Lindy’s favourite non-committee member. June, 2009. 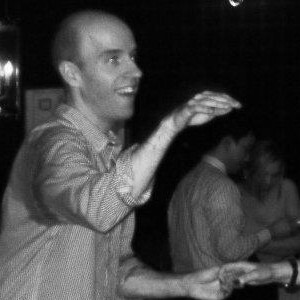 Before moving to Manchester, someone reminded me that swing dancing existed. I’ve liked the music since I was a teen and was exposed to some records my grandparents had. I decided to look up any dance offerings when I moved here as an excuse to get out of the house. I found Kate’s and Mike’s class at Sunshine Studios. My sister’s kitchen with my nieces. Alright then, when were you adopted as the ‘token American’ by the committee? I don’t know when I became, or that I am, the token. (Writer’s note: he isn’t a token anymore. He’s a New Jersey-Mancunian). Worn-down Onitsukas. They are light and provide the right feel for the floor when broken in (not too grippy or slippery). Although they tend to get smelly not too long after the wear-in process. Boring my partner with either a bland dance–seeing their face that reveals they’d rather have the song end- or one with a mess of moves but with no feeling. Some might say pecks, others might say excessive leads of turns or spins. I’ve hit the improvement wall/plateau many times, that I am at the limit of my abilities. Usually it is a matter of getting over myself, but some coping strategies include dancing with as many new people as possible, and listening to my favourite songs without thinking how I’d dance to them. Listen, and ‘get’ the music. Kate and Mike: some of their social dancing looks like choreography when I know they’re just making it up right in that moment. Modern ‘professionals’: Skye and Frida (obviously), Peter Strom together with Laura Glaess, Ryan Francois when he gets a bit of Frankie Manning going. Yes. Arrhythmic dancing, lead/follow moves that don’t fit with the follow/lead, stopping your dancing because of the previous two. Like all mistakes, they are learning opportunities; it is inevitable that they will happen, so don’t be afraid to make them. I hope the Lindy community remains a community, and that people continue to come dancing. I hope that with the push to get dancers out to more live music, the musicians try to emulate more the earlier sound and feel.